I continue to be heartbroken over Dame Daphne’s passing. The world has lost an amazing and devoted leader for wildlife conservation. “Those who cannot speak” have lost their leader. Thankfully her daughter Angela and the devoted team at DSWT will carry on her hard work and legacy that she spent a lifetime building. Dame Daphne’s spirit will graciously be a part of each orphaned elephant. She had devotion for all wildlife. This amazing woman showed the conservation world what one person can do to make change. May her beautiful spirit continue to migrate with the movement of the elephants. Deepest condolences to the famiy and keepers. I treasure the time I met Daphne at the Elephant Orphange. I wish I could express how heartbroken I was to read that Dame Daphne had died. What a wonderful woman she was and what a wonderful legacy she has given our world. When I think of how many beautiful, intelligent elephants and rhinos and other animals she saved, I am in awe. The difference one determined woman can make is truly amazing. We are also so fortunate that her daughter and all the dedicated Keepers will keep her work going. Please accept our late response to the very sad news of Dame Daphne Sheldricks passing. Please accept our heartfelt condolences to yourself, your family, and indeed to the whole wonderful team who make up the DSWT. We can only start to imagine the loss felt throughout, however, in the spirit of that special lady, we are sure that “the show goes on”. The value of her inspiring creation is priceless and we know that you and everyone involved will not pause in your endeavours to continue building on that legacy. With respect and deep admiration from 2 East African born members. Peter and Penelope (neé Flatt) Madvig. Ces vraiment avec beaucoup de tristesse que j’apprends son décès et je suis de tout cœur avec vous. Cette femme fais partie de ces êtres extraordinaire qui bien souvent travaille dans l’ombre. Je sais que vous ,sa fille et tous les gardiens continuerai a sauver des milliers d’éléphanteau. Je suis votre travail depuis des décennies et je sais que beaucoup de larmes ont coulé,mais aussi beaucoup de joie et de satisfaction pour le travail accomplis. La visite impromptue des éléphants que vous avez sauvé et relâché afin qu’ils redeviennent libre en aies la preuve. Dame Daphne and the whole Trust family: What a treasure to have such an inspiration during our lifetime. She truly educated me on elephant behavior and the great continent of Africa with its creatures great and small. I have always cared for wild creatures starting at a very young age and watching the interaction Daphne had with all animals inspired me to visit Zambia. This was life changing and so I guess Daphne changed my life as well as my outlook. Thank you for all you did during your lifetime and the endless giving that will continue through the Trust you started. What an incredible human. My deepest condolences go out to all of the friends and family of Daphne Sheldrick as well as her wonderful staff. She was a special person with the amazing and courageous things she’s done to care for all these beautiful baby orphans. I was fortunate enough to visit the sanctuary in Nairobi in October and see how loved and protected the elephants are. Her legacy will live on forever and we know Angela will continue her parents dreams and accomplishments to and make sure the elephants are safe and continue the fight against poachers. We all stand behind you Angela and I will continue to support your wonderful organization. It is with a heart heavy with gratitude toward your mother Daphne, that my husband Danny and I send our deepest condolences. We are so very sorry for your heartbreaking loss. Because of her passion and her work, we are also inspired to actively do everything we can to save and protect the elephants she – ad we – love. You, her daughter and family honor her, as you continue this beautiful work that she and your father, so brilliantly started. I want to express my condolences about the passing of your mother. Whoelse but she was worldwide known as an icon for the raising up of orphaned elephants and set them free into the wild again. I am following your reports since many years and I am always eager to read the latest news. I admire Dame Daphne Sheldrick for her great strength in willing to make any effort to achieve her goals for the protection of elephants. I am sure you will successfully follow in the footsteps of your mother. My deepest sympathy to you and your Team. Please know that Daphne’s passing was felt with much sadness. My thoughts have been with your family and the organization since I heard the news. I have admired the great work she has done and the love and kindness she showed to the elephants and all the other animals that are rescued through the Wildlife Trust. I know the beautiful and hard work will continue as she wanted and this makes me very happy. People like Daphne pave the way for others to be kind and show compassion to all living things. It is with much appreciation that I write this to honor her, and all involved in the David Sheldrick Wildlife Trust. I have fostered an elephant for quite a few years now and am very, very thankful for everyone who puts forth the effort to make sure my dollars go to a wonderful cause. Thank you, Daphne and Thank you, Thank you! to those of you carrying on her gracious vision! It has been an enormous privilege and honour to meet Dame Daphne in 2005 while visiting the Nairobi nursery. Her deeply touching book “An African Love Story” will always have a special place on my bookshelf and I’ll continue sponsoring little elephants for the rest of my life, taking thus a tiny part in the wonderful work she and David started so many years ago. I was saddened to hear of her death just a month ago. She can now rejoin David, Eleanor and her other blessed beings. I saw Daphne Sheldrick when I visited the facility in Nairobi and adopted my first baby elephant – Nasarian. 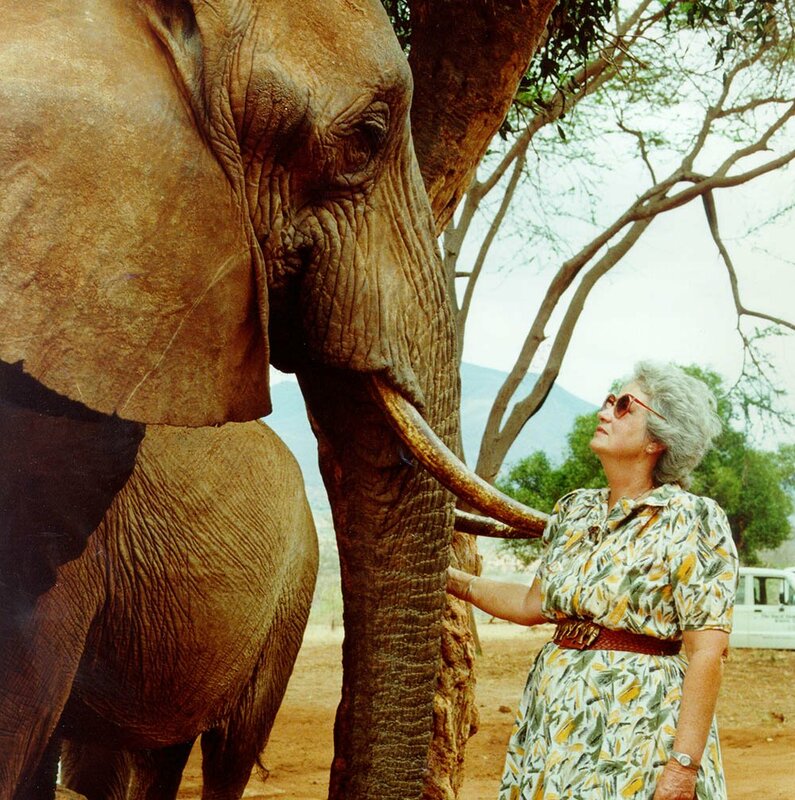 Daphne inspired me over the years to do all I could to help elephants and other wildlife. Words could never express my gratitude for all that she has done to help elephants. The world is a better place because of Daphne Sheldrick. Beautiful lady dear Dame Daphne! A friend at work introduced me to you and your brilliant elephants. Jo-Anne was taking a trip to South Africa and visiting your orphans on a flying visit. I gave her a small donation to pass on never knowing just how hooked we would become! We now foster 2 elephants and a rhino – one for us and two for lovely parents now in their 90’s. We are a world away in Australia however through your newsletters and the marvelous paintings (thank you Angela) we feel part of your community. The animal world has a huge empty space to be filled. Angela, I wish you and your family all the best to continue the incredible legacy Dame Daphne has provided. I know your family will be feeling the loss and our sympathies to you all. I also expect my orphans Kenia and Ndii will miss her. I was heartbroken when I heard the news of Dame Daphne’s’ passing, she was such an inspirational woman. I’m sure Angela will continue to carry on the good work that her mother started and that her mum will be by her side everyday in spirit. I was very sad to hear of the passing of Dame Daphine. My husband and I have been planning a trip to Kenya for many months and we hoped to meet her during a visit to the elephant orphanage. Unfortunately that meeting with not happen. God rest her precious soul, in peace with the people her life touched and the elephants that she saved, nurtured and put back to the wild. Daphne introduced me to the DSWT which has become so important in my life. I always loved elephants, but never knew I could become personally involved in their lives. One of my best life moments was in Jan of 2017 when I met my first adoptee at DSWT. Unforunately I never met Daphne, but feel as though I know her through her work. I shall be eternally grateful to her and for her amazing life. So sad to hear of Daphne’s passing. A huge inspiration, the world needs more like her. Her autobiography is the best book I’ve ever read.